of course. But “Tank,” a robot, could be up to the challenge. Tank is part of a new breed of robots being created to work alongside people in the oil and gas and petrochemical industries with the mission to keep us safe. “Petrobots” will soon be doing jobs that are either too risky or impossible for humans to achieve. Petrobot is a three-year joint-industry research project supported by a grant from the European Commission. Now in its final year, the project is creating robotic tools for the inspection of pressure vessels and storage tanks. Chevron, through its Aberdeen, Scotland-based, Chevron Upstream Europe (CUE) business unit and Global Technology Center (GTC), is among the consortium of 10 companies funding the research. The project mobilizes the complete value chain of robotics, technology and inspection providers and end-users in the oil, gas and petrochemical industries. The PETROBOT project aims to develop a series of robots which can be used by inspectors to conduct remote inspection of pressure vessels and storage tanks widely used in the oil, gas and petrochemical industry. John O’Brien, focus area manager for Energy Technology Company (ETC), was involved in the initial identification of applications for Chevron. “Robotic inspection is a firmly established technology in the nuclear and aerospace industries. Partnering with service providers from these industries has enabled us to develop solutions for use in our own industry,” he said. According to the National Institute for Occupational Safety and Health, an average of 92 people die in the United States every year working in confined spaces. Repair, maintenance, cleaning and inspection activities account for a quarter of the fatalities. The Petrobot team has developed three offline pressure vessel inspection robots and one online tank robot, used for inspecting tanks that contain product. These are currently going through field trials to test the robots’ capabilities in detecting a range of potential defects such as weld cracks, pitting and wall thinning. “Snake Arm” is a robot with a long, slender, flexible arm that can fit through small openings and around obstacles. It can navigate through an open space using “nose following,” which enables the arm to follow same path as its front end. “Fast” uses its magnetic wheels to climb walls and maneuver in confined environments. Like all the offline pressure vessel robots, it carries visual and other inspection equipment. “Bike” is a small autonomous robotic crawler, also with magnetic wheels, designed specifically for complex environments within offline pressure vessels. Bike is even capable of climbing over obstacles. “Tank” can carry out inspections while product is still stored inside. The semi-autonomous robot carries visual, magnetic and ultrasonic inspection technologies to investigate the condition of the tank floor. 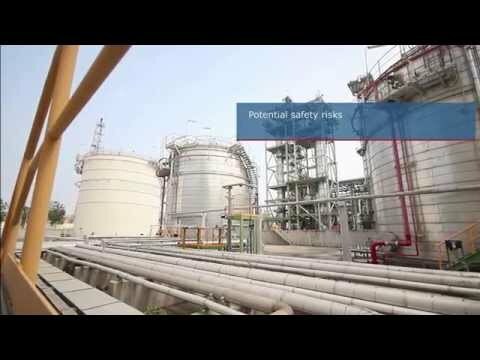 Traditionally, to ensure the safety of people entering the vessel, oil, gas and petrochemical plants shut down during inspection operations. Vessels are decoupled from live sections of the plant, as closing a valve is insufficient. Then the plants are extensively cleaned to remove all products that can emit flammable or toxic gases. Larger vessels can require scaffolding to be erected to allow inspectors to access all necessary areas. Following inspections, which often last several hours, all of the preparation work is done in reverse. Robotic technology like Petrobot aims to change all that, as it can significantly reduce this lengthy and costly procedure while also minimizing exposure to potentially hazardous conditions. Chevron’s participation in Petrobot is aimed at specifying end-user requirements for the technology, measuring robot performance against those needs and ultimately becoming an end-user of the devices. Chevron is an important part of the United Kingdom’s energy market.